Alongside Black History Month, a community of cosplayers have created the hashtag #29DaysOfBlackCosplay to highlight cosplay diversity. Foursaken Media continues to put out game after game, and not long after releasing All is Lost, the developers are planning on releasing their new game, War Tortoise, somewhere in March or early April. As for what this new game is? Well, as it’s usually their style, the developers have taken different genres and molded them together. As the developers describe it in our forums, War Tortoise is like a clicker/tapper but you replace the clicking/tapping mechanic with 3rd person shooting. What that means in terms of gameplay is that there’s an emphasis on wave progression, the upgrade loop, prestige mechanic, and manual vs auto DPS. You can see from the gifs below that there’s a crazy amount of action going on on screen, and it looks like a lot of fun. Back in December we checked out the trailer for a clever upcoming puzzle game called Zenge. The actual puzzles were similar to Tangram puzzles, but with a couple of unique wrinkles. One is that each of the pieces of the puzzles had a track of sorts, meaning it had to be slid in in a certain way. Since some pieces could interfere with the tracks of the other pieces of the puzzle, putting the pieces together in the correct order was a key component in addition to placing it in its correct orientation and spot on the board. The other neat feature of Zenge is that each puzzle created a picture which went towards telling an overarching story. A few days ago Zenge developer Hamster On Coke Games (yes that is their actual name) posted a brand new trailer for the game. The Voxel Agents’ long-planned resurrection of their Train Conductor franchise finally comes to frutition this week, as Train Conductor World releases on March 3rd. The game’s been given a fresh coat of paint with three-dimensional visuals, but The Voxel Agents says they’ve also done some work on refining how the train conducting works to be better than ever. Considering that the series hasn’t seen a new entry in over 5 years, one would hope! But then again, trains are trains and I mean, switching rails can always be made more efficient, but it’s still rail-switching. The point is that Train Conductor World should bring back some tried-and-true fun from a franchise that has seen over 7 million downloads back in the earlier days of the App Store. And of course, along with the new tweaks and levels, comes some tricky new challenges to complete and train customizations to unlock. Pimp that train! Mediocre Games is the name of a company that makes really good games. It can get confusing, but it also makes sense. Most of the companies that flood the App Store with crappy shovelware are named “Best Top Games Flappy WhatsApp Kim Kardashian Company Limited” so I guess there’s an opposites effect in play. 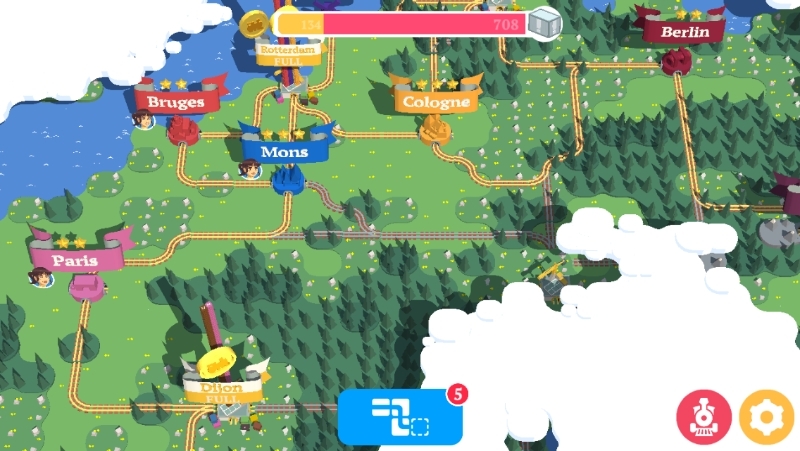 Anyway, the company that brought us such gems as Does Not Commute [Free], Smash Hit [Free], and the Sprinkle series are back again with an interesting new puzzler called DIRAC that’s like a game of fast-paced connect the dots. Red and blue protons slowly emanate out from an atom and it’s your job to connect as many same-colored ones as you can together without an opposite-colored one touching the line you make. In addition, if you can connect enough to create a giant circle, you’ll be awarded points for all the protons of either color that get trapped inside that circle. It’s a bit tricky to explain, so check out the brief trailer to get an idea of DIRAC. The idea for this game seems completely ridiculous and I am entirely on board for what Bored Ogre is doing. Check out the forum thread, where you can ask Frozen Pepper questions about the game and provide feedback. I’m anxious to see and hear more about this silly game. Watching the rapid evolution of VR technology in recent years has been pretty fascinating. Both the Oculus Rift and HTC Vive are now available for preorder, but as we’ve pointed out before, Google has shipped millions of Google Cardboard viewers. While the Cardboard experience is (obviously) nowhere near as good as what the Rift or Vive can offer, the accessibility is comparatively totally off the charts. Most people already have a smartphone capable of running Cardboard VR games and apps, they’re just missing the actual set of plastic lenses and the folded up cardboard to bring the whole experience together. Surprisingly enough, that’s where McDonalds comes in. McDonalds locations in Sweden are kicking off a promotion called Happy Goggles. As the above video shows, the iconic red cardboard Happy Meal boxes are going to come packed with the lens kit and clever perforations in the box itself to carefully punch out and fold up your own Google Cardboard-like VR headset. The Happy Googles site mentions this is being tested in Sweden, but they hope to roll out the promotion to other countries soon.